One of the many things I’m passionate about is food. I enjoy eating. And I really enjoy eating good food. No, great food. Better yet, “personal” food. You know, that food that you could eat a thousand times in a row and you would never get tired of. You want to eat it when you are having a good day or a bad day. The smell. The taste. The experience. It captivates you. It draws you in. You know you’ve found it when both your tummy and your heart are made happy by it. I don’t know what that is for you, but for me one food stands above the rest. There is no competition. Outback cheese fries! 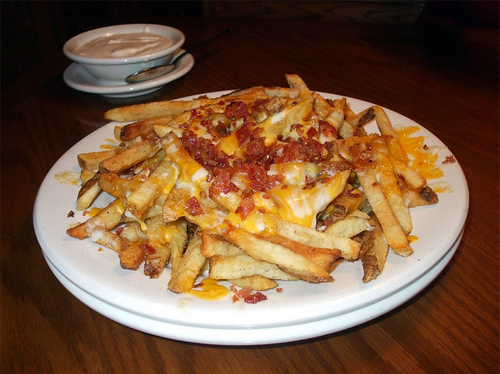 A couple of months ago I went to a local Outback to have a plate of their mouthwatering cheese fries for an appetizer. And the way I eat them is by dipping them into some of Outback’s delicious ranch dressing. And yes, I know that greasy cheese and fatty ranch isn’t the best for me. But I really, really, really like their ranch, especially when it’s combined with cheese fries. I like it so much that I have to ask for extra ranch dressing each visit. Well something happened during this trip to Outback that I can’t remember ever happening before. I didn’t have to ask for more ranch. As I was about to ask our waiter, Paul, for another cup of ranch he was walking towards our table with a cup in his hand. I was surprised and thankful. Then to top it off, when our dinner was brought out, Paul put a cup of ranch dressing on my dinner plate. Again, without me asking. As I’ve thought back on that night, one word keeps coming to my mind—Anticipation. Paul had an ability to anticipate what it was that I wanted without me ever asking him. He genuinely cared, engaged with me and others at our table, watched what we enjoyed and took mental notes. Then he acted on it. Paul’s ability to anticipate separates him from other waiters who never get the clues that people give them. I bet you’ve had a moment where someone anticipated something you wanted, needed or liked without you ever asking them. How did they know? Simple—they cared about you and got to know you. Each day you have the opportunity to anticipate in the relationships you have. If you will do it, you will grow in those relationships and show to those people how much they matter to you. And you might just surprise them like a cup of ranch dressing surprised me. What are some ways you could anticipate in the relationships you have? Thanks for reading and for your encouragement, Edward!